Fatlinda Rrustemaj (bottom right) play fights with her cousins during Bajram celebrations on July 5, 2016 in Peja, Kosovo. Bajram marks the end of the Ramadan and is celebrated through traditional food and spending time with family. 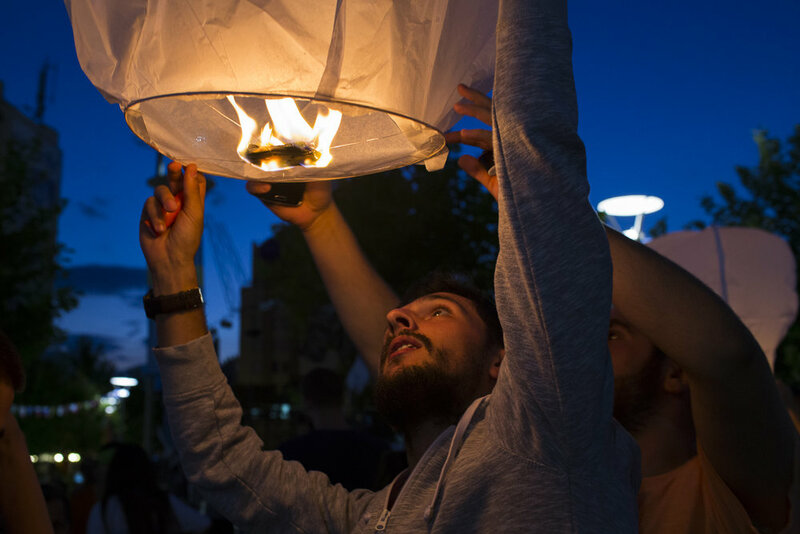 A man holds a lantern before setting it off on July 20, 2016 in Pristina, Kosovo. Lighting lanterns was part of HAPU, a festival of artwork that is displayed in public spaces. Renee Nuzzo, left, of Mexico, reacts to daughter Kassondra Nuzzo, 7, winning a water race game on Saturday, Aug. 27, 2016 during the New York State Fair in Syracuse, N.Y. "My arms aren't big enough," she said after turning down the opportunity to play again. Nikolette Scruggs (18) of Baldwin Wallace University reacts after winning a point against St. John Fisher. on Friday, Sept. 16, 2016 at the St John Fisher College Invitational at St Joh Fisher College in Rochester, N.Y. Baldwin Wallace University defeated St. John Fisher 3-0. Polly Orlebeke, an election inspector, rests on a chair during a lull while waiting for people to vote at Penfield High School in Penfield, N.Y. on Nov. 8, 2016. Orlebeke arrived at the school at 5 am to set up and assist voters in casting ballots.